Minecraft owners with an Xbox system sure do get some lovely prizes from time to time. Most of these arrive in the form of reskin packs that transform your worlds into wild new playgrounds. We've had a taste of The Simpsons, jumped into Star Wars a time or two, and even unwrapped a few holiday presents in the form of Santa and his elves. The latest pack ditches licensed works in favor of something much more simple: patterns. Pretty, pretty patterns. Yeah, I know, it sounds a little bland, doesn't it? A Minecraft skin pack that's just a bunch of patterns. But honestly, looking through the gallery changed my mind pretty fast. Animals look like they were knit out of wool. Pigs wear sweaters. Pickaxes can be pink. Swamps are suddenly cheerful. Even the Nether looks a notch more friendly. There's a slight Easter theme to the light colors, but overall it's just a bright and cheery look for your existing and new Minecraft worlds. Call me mad, but I like it. 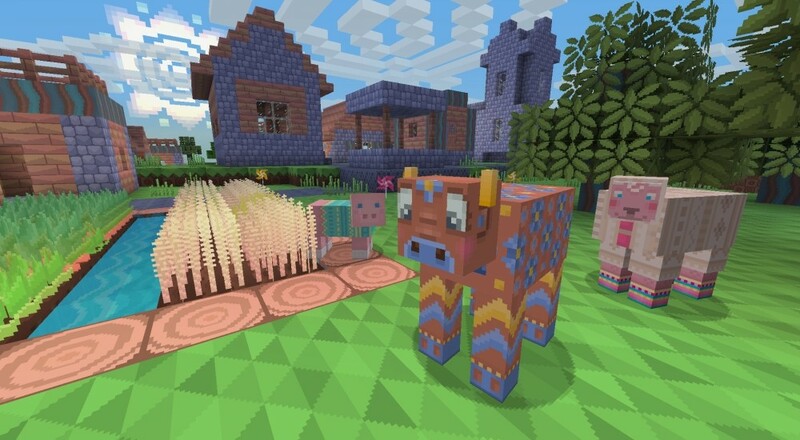 You can grab the Minecraft Pattern Texture pack for both Minecraft: Xbox One and Minecraft: Xbox 360 editions. The cuteness will set you back a paltry $0.99 USD. Page created in 0.6898 seconds.